« [30-08-2010]Possible upgrade window at 00:00 hours! The toughest decision we have taken to date on this project. Deciding the topic for this blog entry. We actually spent half an hour last evening trying to figure out an apt topic! Jokes apart, there is a fairly serious reason why we faced such an awkward problem. It is difficult to put in words what we went through yesterday afternoon. We were simply numb after we managed to get out of the Mir Ashraf conference hall after presenting our idea to the VC. Both me and Ankit. To every single one of our proposal and suggestion there seemed to be one reply from the Vice Chancellor, ‘Yes! Consider it done!’. 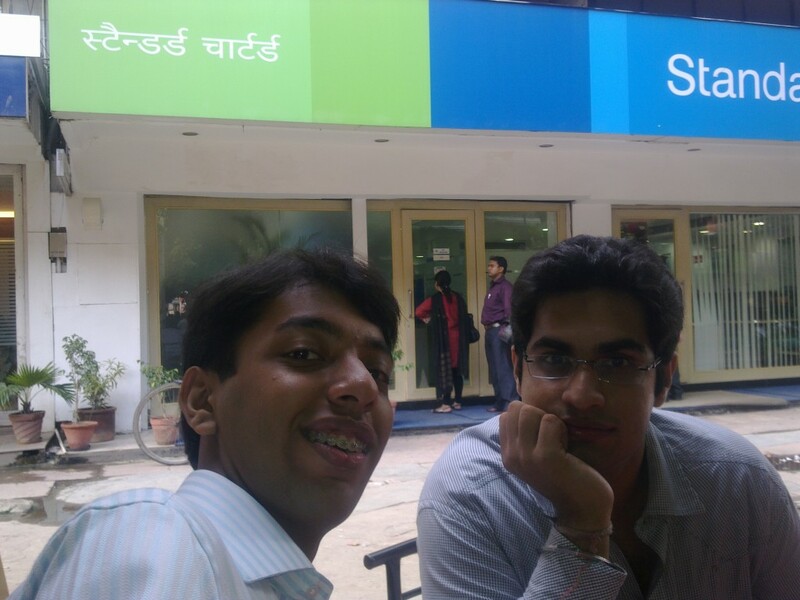 Me and Ankit after the meeting. Excuse the freaky me peeping into the picture. And I wish Sharique was in it too! As I write this blog entry I am reminded of last September. It was on one of the sleepless nights of the month of Ramadhan that I and Sharique sat through the entire night figuring out what we wanted to do for JMI and how we seemed to have failed in giving back something to this great organization which has given us so much. There was a lot that could be done but we just weren’t sure where to start. Around the same time Ankit was envisioning a similar project! The day we met and the way things progressed from there is nothing short of a miracle. God surely was certainly with us as he seemed to be yesterday as well. We went in yesterday with a fairly well laid down plan. We had been working on it ever since I met the VC on the 19th of August. 28 slides is what we had after days of hard work! The plan to reform this college inside out and get its righteous due in the world! The meeting was attended by the following personnel(sadly we forgot to click a picture!). You all would be happy to know that Professor Khalid Moin, Dean, JMI FET has graciously accepted the task of heading this project from the administration side. This being another one of our wishes which came true yesterday! Right from the start we wished for a dynamic leader to lead us into what we see as a new era for JMI FET. And with Professor Moin at the helm of proceedings I am sure we will be able to do it all! We will now be moving into top gear with regards to developments on this project. Work will progress on 2-3 fronts from now on and we are in the process of pulling up an extensive roadmap with set deadlines that we will be sticking too. We hope to publish our immediate roadmap within this week. Would appreciate comments and suggestions on the same. My sincere thanks to all those students, alumni and faculty members who made this project what it is today. It was an exceptionally beautiful feeling to be able to present the 32 names of students and alumni in front of the VC(check presentation embedded above for more) who are working for this project! And the VC complemented your efforts. Good job! And yeah he has even agreed to our clause of recognition certificates for project members signed personally by both the Dean and himself! We are now inviting more people to join the team with the promise of official recognition from the Jamia Millia Islamia administration. The mails to the individual teams with their respective agendas will be sent out very soon. Check out this page on how to register with the project! Here’s hoping for your continued support for the project. Together I am sure we will be able to accomplish this collective dream of ours! And before I wrap up let me quote another significant reason why I think this project is bound to succeed. Yesterday, that is the day when we finally integrated ourselves with the JMI administration happened to be the 27th night of Ramadhan. For all those who are unaware of its significance, the day is considered to be the most auspicious day in the Islamic Calendar. Better than a thousand months put together as written in the Holy Quran. Would like to close this post with this small thought! Long live Jamia Millia Islamia. This entry was posted on Tuesday, September 7th, 2010 at 11:58 am	and is filed under Project Updates. You can follow any responses to this entry through the RSS 2.0 feed. You can leave a response, or trackback from your own site. Great job guys!! Happy 4 you! Great ! !